My Two Baby Sisters pattern is 60″ x 66″ made out of Hoffman Fabrics. 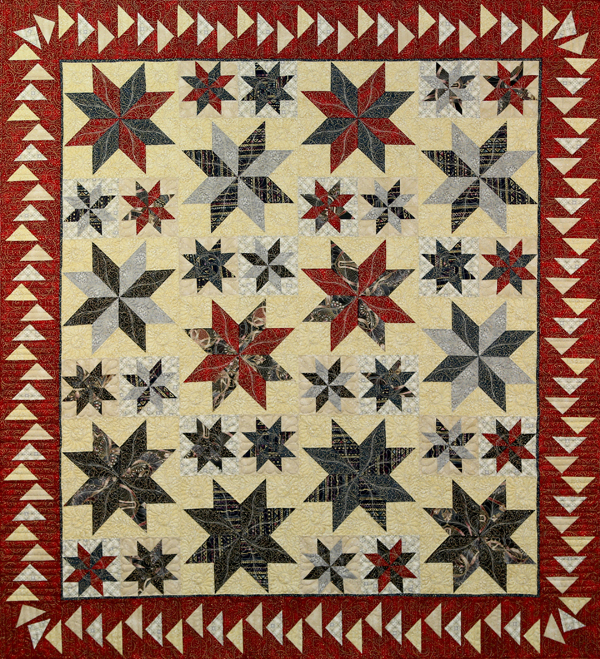 This quilt was designed by Judy & Bradley Niemeyer, published March 2013. 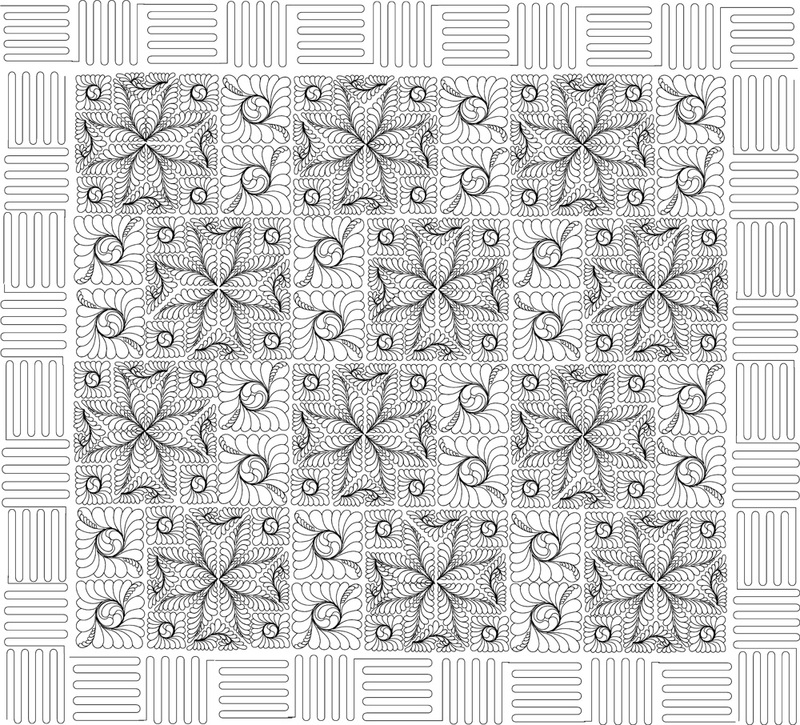 My Two Baby Sisters is a redesign of the Meandering Stars pattern and has been updated to include the latest techniques and design approaches by Quiltworx.com, including floating points and template layout sheets! 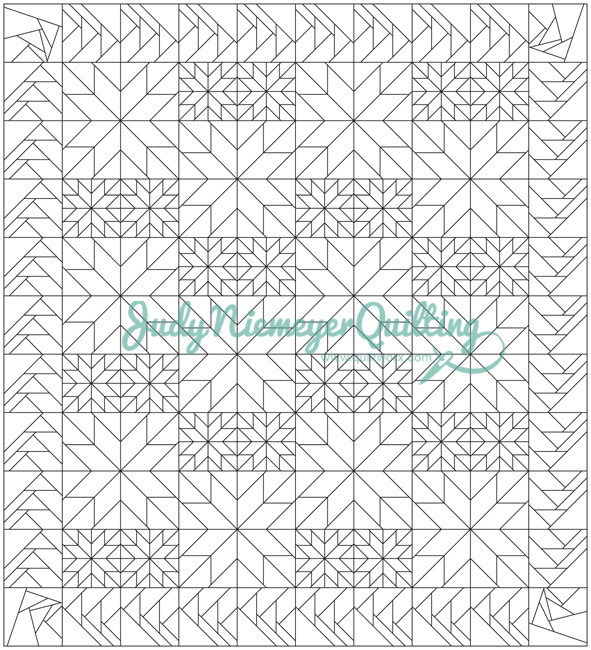 The pattern comes with all of the papers necessary to complete the quilt on the cover. The quilt sample was completed in 2012 by Quiltworx.com staff. The quilt was quilted by Quiltworx.com Staff using designs that can be found in the related products or on our digitized design page. Jandy Hartman Arnold Another one with polka dots! I'm loving these fabrics! Andrea Lapidus Diamond Jackie Kunkel. I love this is blacks, whites and brights. 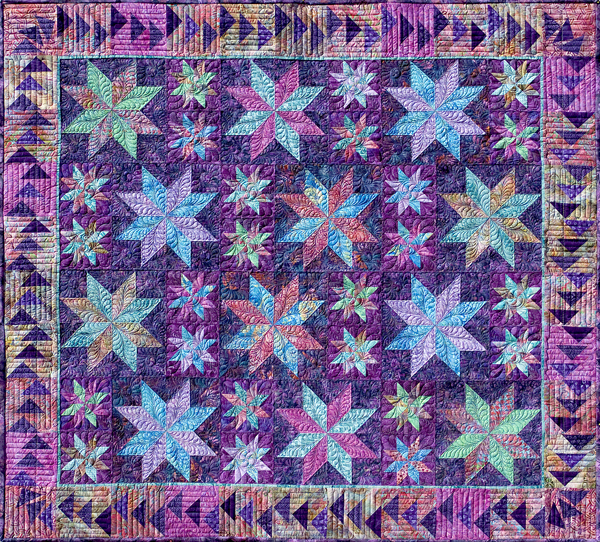 Bonnie Banick Kane Might just be my favorite Quiltworx yet -- very "personable." Sandra York Love, love, love these colors. Beautiful quilt. Cute dog too. Mary L. Sellers Collins Been working on mine the last couple of days. Camilla Huston Noyes Has anyone who has made this quilt had a problem with the small blocks when sewn together not matching the larger blocks? Eileen Wright I too just love those colours! And the quilt! Marie Bowden Love the colour combo. Love the star pattern, might have to try this one. Congrats on a lovely quilt. Paula Reeves Love these colors! Marylou Helt Hill What a great resting pad for this darling Cavalier! Pat Mourek Love the colors. Gorgeous quilt. Elattra M Hardin LOVE THE COLORS & STARS. Maureen Frocklage-Paron Wow, just beautiful!! Lorraine Fedchuk I love this one!! Wiwik Winarni Wow...love the colors..! Elaine Golinski Beautiful Colours In This Quilt.... Awesome ...!!! Brenda Barnett Retzlaff I love this. The colors are great. Andrea Garhartt Such a beautiful quilt. Kathleen Roth Very pretty. ! Like the colors & pattern! Mindy Ellen Reeves I'm working on this quilt right now - love this version of it! Linda Lee Betley The colors are extraordinary....beautiful! Ellen Kruizenga Very bright and colorful! Faith Jacob Love it, I have never seen colors so amazing ! Selma McClarigan Oh pretty. Pretty! Pat Anglin Truly art with fabric ! Awesome ! Brenda Barnett Retzlaff So gorgeou! My Two Baby Sisters, Quiltworx.com, Made by ? Kelley Hill This was made by Cathy Lambert from Tallebudgera. Cathy attended a workshop at Fifisfabricology on the Gold Coast. 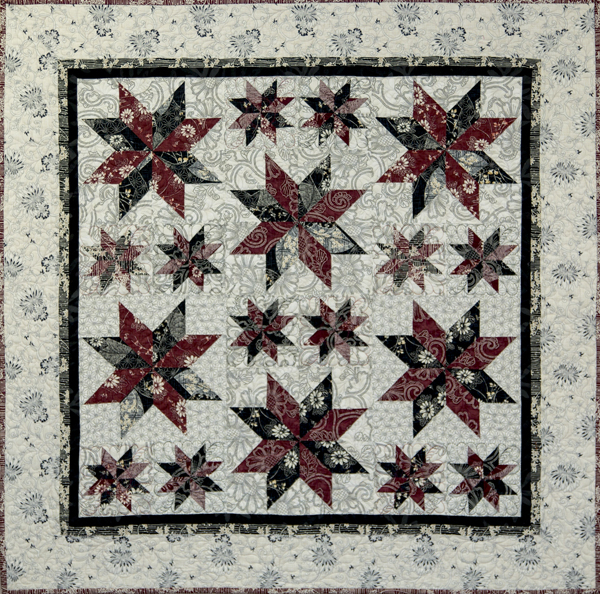 Allene Heitzmann I love stars always and the quirky flying geese border is a great change up! Teresa Elam Ayars Love it! My Two Baby Sisters, Quiltworx.com, Made by Marilyn Graham. Linda Noto So cheerful !!! Ann Glines Love the staggering of the flying geese. It is unique. Melaine Moyle Love it couldn't be any better colors and pattern are awesome! Deborah Cornes Fitzer Very pretty! Penny Hoyt Love her fabric colors!! Stephanie Alcock I'm just starting this one - in black (background), silver and gold. My Two Baby Sisters, Quiltworx.com, Made by Stacie Stocks and taught by CI Sandy Lueth. Vinette Menshek Oh my stars. Love it. Julie Miller Kalbacher That is amazing!!! Susie Miller Orozco that is the most beautiful quilt i have ever seen! My Two Baby Sisters designed by Quiltworx.com, made by Nancy Albasini. Won 1st place in my division at Western Idaho Fair in August, 2013.